Humans have long looked to wild animals to predict the weather. Each year on Feb. 2, groundhogs are hauled out of their winter homes to tell us whether we will have six more weeks of unpleasant weather. The yellow-billed cuckoo (aka, the rain crow) has been relied on to warn us if a storm is on the way. 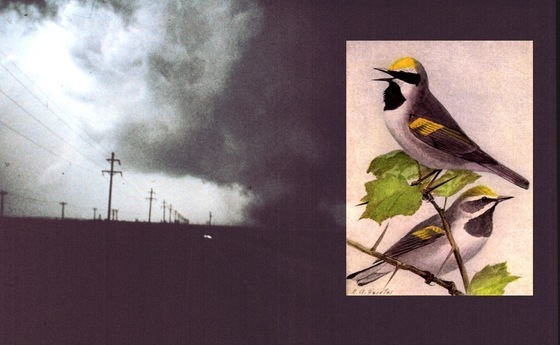 Even fish and crows are on the list of animals used to forecast the weather. But nowadays we depend on sophisticated technology for predictions, and it’s easy to view beliefs that animals can do the same as legend or superstition. But that may not be right. Read the rest of Terry’s column to learn about this study's surprising findings. How to catch a ghost? If it has a 6-foot-plus wingspan and a taste for carrion, try roadkill. And patience. Although one of the largest raptors, golden eagles are called ghosts of the eastern North American forest because of their secretive ways and preference for high-altitude woodlands. But research using camera “traps” and transmitters is revealing their migration paths and habitat use in the East. That study began tracking a third Georgia bird on Feb. 22. 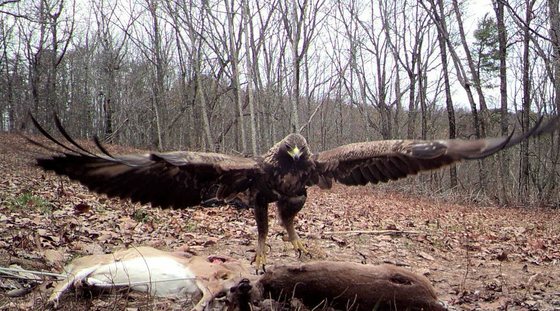 For three winters, golden eagles have fed at a camera-monitored bait pile stocked by the U.S. Forest Service on the Chattahoochee National Forest near Dalton. This February, one eagle was returning like clockwork, said Forest Service wildlife biologist Ruth Stokes. The first try at trapping it – an 11-hour wait in rain and fog – failed. The second landed a second-year male. See photos and video of the release. The Appalachian eagles project led by Dr. Tricia Miller of West Virginia University – and joined in Georgia by DNR’s Nongame Conservation and Game Management sections, the Forest Service, and nongame friends group TERN – is monitoring cameras in multiple states and tracking 25-30 eagles from the Southeast alone through transmitters the size of small phones with solar-rechargeable batteries. The other two Georgia eagles, named Devil’s Backbone and Flint for their catch sites, spent last summer in separate sites. Devil’s Backbone flew to eastern Quebec, a common hangout for eastern U.S. golden eagles, and Flint to Ontario. The study is showing that migration patterns tend to differ depending on how far south and west the eagles winter, Miller said. Flint was the project’s first eastern bird to migrate to Ontario and the first to fly by the Hawk Ridge Bird Observatory in Minnesota. Where the ’Hooch eagle will go is up in the air. Young birds wander more than adults, Miller said. Stokes stressed that healthy habitat for golden eagles means large contiguous forests with lots of sunlight and low tree density. For more than 10 years, the Forest Service has used thinning and prescribed fire to restore and maintain woodlands in the Armuchee area, benefiting many species. Stokes also said the day after this eagle was caught, another came to the bait pile. - Though the golden eagles are tracked in real-time, to protect them only occasional updates are posted by project partners such as DNR and the Forest Service. - Seeing a golden in the wild in Georgia is a long shot. “They’re ghosts,” said Nathan Klaus, a DNR senior wildlife biologist and skilled birder. After working some 20 years in middle Georgia forests frequented by two of the tracked birds, Klaus has seen only one golden eagle other than those trapped. - This year, bait at Sprewell Bluff Wildlife Management Area near Manchester attracted only the tracked birds Devil’s Backbone and Flint. Klaus hopes to catch an eagle next winter to use the one remaining transmitter bought by TERN. If you enjoy Georgia wildlife, this tax season help native nongame and plant species survive and even thrive by contributing to the Nongame Wildlife Conservation Fund checkoff when filing your state income taxes. Every donation, no matter the amount, helps. The checkoff helps species as varied as loggerhead sea turtles and Georgia aster wildflowers. But checkoff contributions have declined in recent years. Help reverse that trend, and give nongame a chance to crawl, swim, soar and grow by checking the checkoff. - Take this brief wildlife checkoff survey. - Follow #GiveWildlifeAChance posts on Facebook and Twitter. - Explore work the checkoff supports in this Nongame Conservation report. 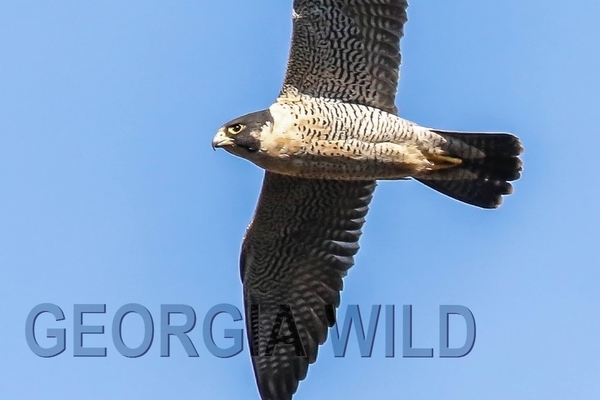 Photos of peregrine falcons nesting in Tallulah Gorge State Park are on Facebook. As earlier sightings suggested, the pair has settled in at or near the 2015 nest site, which – unlike last year’s nest – is in view of a gorge overlook. Issues tackled at the annual meeting of the Coastal Georgia Cooperative Invasive Species Management Area (CISMA) ranged from updating the group’s invasive species priority list to revising regional strategies on key topics such as emerging threats. Representing nearly 20 agencies and organizations, participants also discussed perspectives on developing a state noxious weed list. Georgia is one of only four states without a state-level list, considered vital to helping stem invasives, which pose significant threats to the state's native species and natural habitats. Young birders have less than a month to sign up for DNR’s Youth Birding Competition, set for April 29-30. The deadline to register for the birdathon, a fun time for everyone from preschoolers to high-school seniors, is March 31. 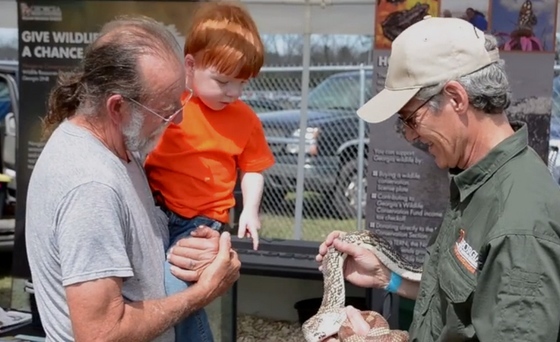 “Common-sense conservation” is the mantra of this weekend’s Claxton Rattlesnake and Wildlife Festival, and has been since the former rattlesnake roundup banned the sale or purchase of wild-caught rattlers or related products in 2012. The lineup March 11-12 will include more than 50 rattlers and other snakes provided by zoos, conservation organizations and the DNR Nongame Conservation Section, plus turtles, birds of prey, fish and more. Watch DNR’s video. Coming March 17-18: Fitzgerald’s Wild Chicken Festival. Photos of giant rattlers often make the rounds on social media, and are as often outed as hoaxes misrepresenting the snake’s size and even the location and circumstances. This Living Alongside Wildlife post offers tips on discerning the truth, and busts a few bogus photos along the way. 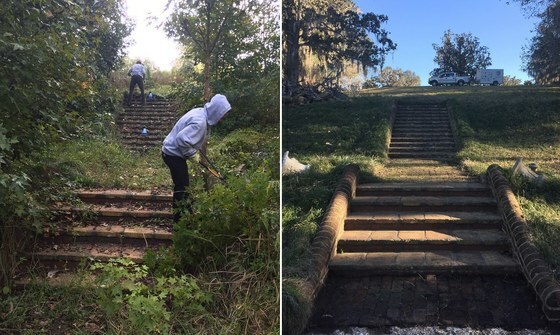 Altama Plantation Wildlife Management Area near Brunswick has benefited from prescribed fires – which led to the discovery of a seepage slope with hooded pitcherplants and other bog plants – plus volunteer work days to restore a 1930s-era formal garden. One garden-work highlight was Nongame Conservation staff teaming with the state chapter of the National Society of the Colonial Dames of America to plant a rare Franklin tree, a species never observed in the wild other than along the Altamaha River and now grown only in nurseries. (The design of the Georgia society’s pin is a Franklin tree flower.) Thompson’s Garden in Brooklet provided the sapling and supplies, and spent a day helping prep the site. Mussel experts including DNR’s Jason Wisniewski have pored over distribution maps for 233 freshwater mussel species to prioritize southeastern watersheds with the most pressing conservation needs. The review, funded through the National Fish and Wildlife Foundation and led by UGA’s River Basin Center and the Tennessee Aquarium Conservation Institute, is key to conservation efforts in the Southeast, home to more than 70 percent of U.S. freshwater mussel species (40 percent occur in Georgia). 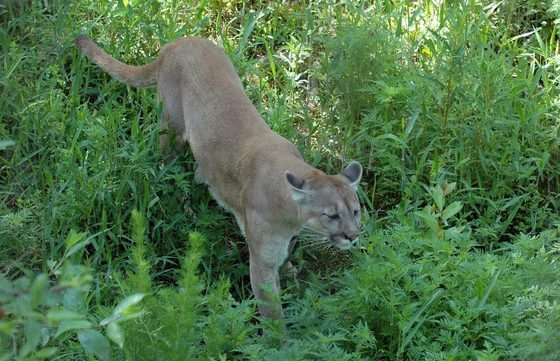 The Florida panther population increased slightly over the past three years, according to U.S. 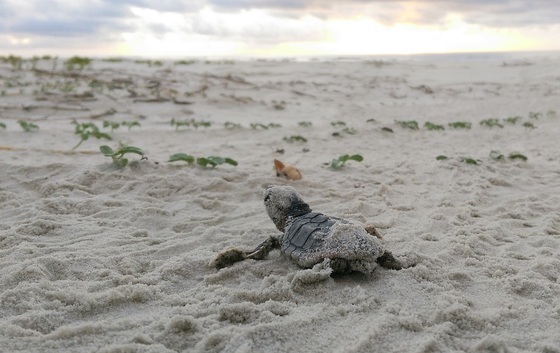 Fish and Wildlife Service and Florida Fish and Wildlife Conservation Commission estimates. The number of the endangered panthers south of Florida’s Caloosahatchee River rose from 100-180 adult and subadults in 2014 to 120-230. The estimated population dipped to 20-30 in the 1970s and ’80s. Names in the news: At the recent Southeastern Environmental Education Alliance Conference, DNR's Kim Morris-Zarneke was honored with an award for Outstanding Service to Environmental Education. 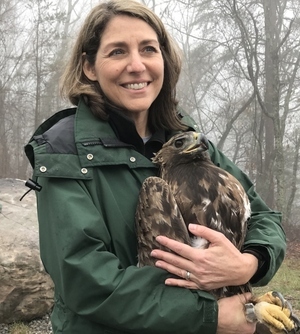 Morris-Zarneke, manager of Charlie Elliott Wildlife Center, has a 21-year career in environmental education and as a longtime leader has exemplified the alliance's mission to "promote communication and enrichment among professionals" in that field. Tall Timbers Press has published Dr. D. Bruce Means' monograph “Diamonds in the Rough: Natural History of the Eastern Diamondback Rattlesnake.” The 416-page book is described as the culmination of more than 40 years of study of the world’s largest rattler by Means, president and executive director of the Coastal Plains Institute and Land Conservancy. New Secretary of the Interior Ryan Zinke rode a horse to work his first day in Washington, D.C., invoking in word and commute the conservation legacy of President Theodore Roosevelt. Kyle Aldinger has been named National Wild Turkey Federation Biologist of the Year in the Eastern Region for his work with the Cerulean Warbler Appalachian Forestland Enhancement Project. Aldinger coordinates the Cerulean Warbler Partnership in West Virginia for the federation and the Appalachian Mountains Joint Venture. March 28 – Chattahoochee National Forest Foothills Landscape Workshop II, 9 a.m.-3 p.m., North Hall Community Center, Gainesville. Also: 5-8 p.m. March 29. March 31-April 2 – Environmental Education Alliance’s Advanced Training for Environmental Education in Georgia – Core Course 2 (Fostering Learning), Charlie Elliott Wildlife Center, Mansfield. Also: June 9-11, ATEEG Core Course 3 (Assessment and Evaluation). - Photos: white sharks and a gator "chin-up"
This Okefenokee pygmy sunfish was caught and released recently by DNR aquatic scientists who were sampling for rare blackbanded sunfish near Lakeland. 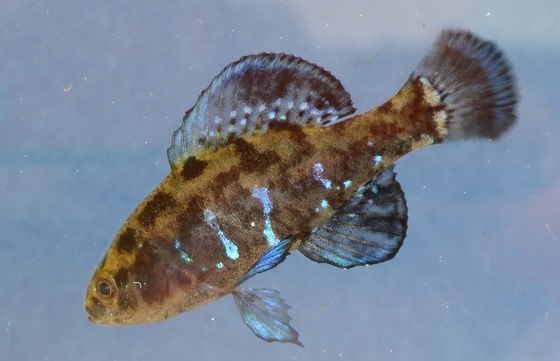 Though common, the Okefenokee pygmy sunfish (Elassoma okefenokee) is one of only seven members of the Elassomatidae family worldwide – and five of those occur in Georgia. The tiny sunfish fits its name, barely exceeding an inch in length. The one pictured is showing male breeding coloration. Spawning occurs in dense vegetation in coastal streams, swamps and ditches.